MEMBERS IN THE NEWS WINE PAIRINGS RECIPE OF THE MONTH EVENTS CALENDAR SPOT THE MARK! 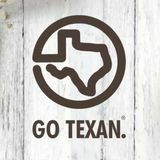 Recap: GO TEXAN Members to Have Products on H-E-B Shelves Help Us Take Your GO TEXAN Product Worldwide! It's Not Too Late to Get Your Texas Essentials! Many eligible activities â&#x20AC;&#x201C; housing rehabilitation, drainage improvements, community centers, other facilities. Most commonly funded projects include improvements to public infrastructure (Ex: water, wastewater, and streets). running water for the first time. In 2017, Rusk County, in conjunction with the City of Reklaw, received a $161,800 Texas Community Development Board Grant (TxCDBG) award to provide first-time water service to eleven households in need. Families in Fairview previously relied on unsafe and undependable wells or bottled water for drinking, as well as, basic functions such as washing dishes, bathing and flushing the toilet. The TxCDBG-funded water infrastructure improvements were completed in May of 2018, using a combination of contracted services and volunteer labor. attended the H-E-B Supplier Diversity Opportunity Exchange in San Antonio, Texas. The event highlighted small business opportunities with H-E-B and one-on-one interactions with members of H-E-B procurement and sourcing teams. Through an expotype environment, small business owners showcased their products or services to these key H-E-B decision makers and fostered new business relationships. Several GO TEXAN team members were on hand at TDA’s GO TEXAN booth where they engaged with consumers and met fellow GO TEXAN members about program marketing opportunities. The event was sold out and very successful. Many thanks to H-E-B for facilitating this opportunity and for being such a great GO TEXAN partner! In 2018, more than 20 businesses who attended the Opportunity Exchange have either begun conversations with H-E-B procurement or have started selling their products at H-E-B! Two attendees were among the top 25 finalists in this year’s H-E-B Quest for Texas Best. The event was structured in two parts: half of the day was workshops where vendors learned about doing business with H-E-B. The other half of the day was spent in an expo-hall where vendors were able to set up exhibit booths, and members of H-E-B procurement and global sourcing teams visit to learn more about each business in attendance. Export Opportunities with SUSTA Gulfood 2019 Feb 17 - 21, 2019 Sunday-Thursday Dubai The United Arab Emirates is a very attractive market for SUSTA region companies. One of the richest countries in the world, the UAE is also a major transport hub in the region thus offering great sales opportunities across the Gulf region for US suppliers. The United Arab Emirates and other neighboring countries import nearly 90 percent of their food and feed needs. All value-added food categories have potential in this market. These are some of the products with the best sales potential: almonds, beef, poultry, snack foods, health foods, edible oils, cheeses, fruit and vegetable juices, condiments, sauces, breakfast cereals, confectionary products, frozen vegetables, pulses, planting seeds, sweeteners, beverages (non-alcoholic), pet foods, and rice. Registration Deadline: November 17th, 2018 To register, please click here. Mexico is a growth market with excellent opportunities for U.S. products. Mexican consumers recognize and associate U.S. brands with high, consistent quality and value, therefore this market has a lot of potential for SUSTA region companies. In this trade show, potential products include alcoholic beverages, breakfast cereals, condiments and sauces, fresh fruit and vegetables, health and convenience foods, processed fruits and vegetables, processed meat products, snack foods. Registration Deadline: December 5th, 2018 To register, please click here. SIAL Canada 2019 Apr 30 - May 2, 2019 Tuesday-Thursday Toronto, Canada w The United States and Canada maintain the world’s largest bilateral trading relationship. Due to limited growing seasons, the Canadian market relies on the U.S. for increased varieties of seafood, horticulture, alcoholic beverages and value-added products. SIAL Canada is attended by more than 18,000 visitors from 60 countries, including major Canadian retailers and foodservice representatives. Through this initiative, participants have an opportunity to meet key buyers, familiarize themselves with general import procedures, explore consumer trends and receive one-on-one assistance to initiate or further their export strategy for the Canadian market. In addition, participating companies will benefit from one-on-one meetings with Canadian buyers and a briefing on the Canadian market. In this trade show, potential products include frozen products, ready-made and canned products, confectionery and pastries, meat and poultry, sauces and condiments. Registration Deadline: January 30, 2019 To register, please click here. Ragan Bond, Co-Founder/Vice President of Independence Coffee Company remarked, “It was one of the best events that I have attended in years. The content, information, attitudes, excitement and quality of presenters was top notch. Everyone could feel how excited you guys were about not only the new launch, but how much you (TDA) want to assist all of the GO TEXAN members with their continued growth and success.” The TDA is a member of the Southern United States Trade Association (SUSTA), which puts Texas companies face-to-face with international buyers through trade missions and trade shows across the world. SUSTA and McLane Global can be used jointly as they are designed to complement one another towards a common goal; to grow and develop international markets for Texas companies. TDA is passionate about putting our GO TEXAN members in touch with the best in the business of international trade. When members are successful Texas is successful. 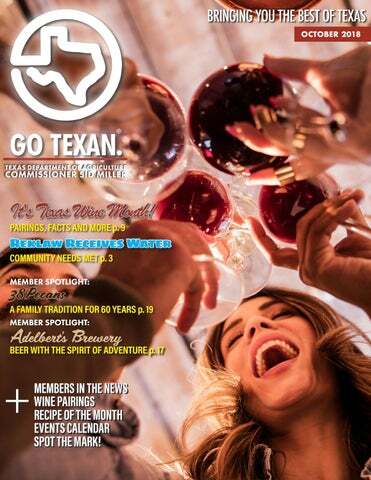 curving the great state of Texas, local winemakers share their annual Texas Wine Month celebration with you. Every year, this unique salute gives our Texas wineries, growers and retailers a tremendous opportunity to let the world know about the robust wines being produced in Texas. We invite you to explore the many tastings and events happening this October Wine Month and uncork the new adventures lying in your own backyard. Visit uncorktexaswines.com for maps and more information on Texas wine, provided by the Texas Department of Agriculture. I t’s that time of year again where everything is going pumpkin! Everyone is turning their attention to the bright orange gourd that is used in different ways, from baking to decorating. Texas is the fourth leading state in the nation for pumpkin production. This, in part, helped drive the 83rd Legislature to designate the pumpkin as the official State Squash of Texas in 2013. Texans have long made great use of the pumpkin. Before refrigeration, ranchers would use the it to help feed their livestock. Now, as more and more Texans have moved to cities, the Texas pumpkins that decorate our homes during the fall are welcome reminders of our rural heritage. Most of our GO TEXAN growers supply pumpkins to agri-tourism sites like pumpkin patches that are prevalent this time of year. Pumpkin patches allow families an opportunity to experience the season in ways that are more than carving a jack-o-lantern from a pumpkin bought at the grocery store. Chances are, though, that the pumpkin from the store came from one of our GO TEXAN members like Lusk Onion. Lusk Onion provides pumpkins to retailers like Wal-Mart in Texas, Oklahoma, Colorado and Mexico. Texas leads the nation in production per acre with yields between 30,000 to 35,000 pounds per acre. 90 percent of our Texas pumpkins are grown in the High Plains. With approximately 5,000 – 8,000 acres of pumpkins planted annually, pumpkin production adds an economic impact of nearly $8 million. T he 2019 Fort Worth Stock Show & Rodeo season is quickly approaching. The Texas Department of Agriculture (TDA) is dedicated to promoting Texas livestock across the world and much of the groundwork starts at livestock shows across the state. These shows provide opportunities to see livestock producers showcase their livestock and promote their brands. Some of the shows and sales you might see TDA staff at are: Santa Gerturdis Cattle Show, American Premier Boer Goat Show, Invitational Ranch Horse Show and Sale, Beefmaster Cattle Show, National Braunvieh Sale, open Brahman Cattle Show, Regional Brangus Cattle Show, Limousin Association’s Lone Star Shoot Out, Premier Texas Longhorn Sale, and the Hereford Champion of the World Presentation, just to name a few. We look forward to seeing you in Fort Worth! veggie dip provided by Southwest Dairy Farmers. Sample Texas-made foods and learn how Texas agriculture impacts your daily life. Explore a variety of educational exhibits, live events and fun for the whole family! •	Southwest Dairy Farmers will have the free Veggie Dip Giveaway Oct 20 and Oct 21, both at 12-2pm. •	Blue Bell Ice Cream will hand out free samples of root beer or Dr. Pepper ice cream floats. •	The Texas Forestry Association will give away free tree seedlings and information about Texas forest to take home. Stop by our booth for a treat on us! SEND US PICTURES, OR VIDEOS, AND BACKGROUND INFORMATION ON YOUR GO TEXAN PRODUCT OR PLACE! HELP US HELP YOUR BUSINESS AND PUT YOU IN FRONT OF OVER 22,000 PEOPLE, FOR FREE! Member Opportunities As a Tier II GO TEXAN member, you have a great opportunity to highlight yourself in this special section, just answer the questions below. Tier 2 or higher members will be prioritized, but all members are welcome to submit information. To upgrade your GO TEXAN membership, please email us. ➢	Provide TDA with a brief history about your GO TEXAN business. ➢	Provide TDA with one example of how you feature the GO TEXAN mark. ➢	Tell readers why being a GO TEXAN member is important to you? If your GO TEXAN business or product has received positive coverage in the news recently, TDA wants to know. Simply send us a link about what was said along with a picture so we can tout your success. It’s that easy! If you are a GO TEXAN member and have a recipe to share, send it our way! Your recipe must feature Texas products, come with high-resolution (300 DPI) photographs and come with clear and precise cooking ingredients and directions. Q: Give us a brief history about y'all and your GO TEXAN business. A: Our founder, Scott Hovey, was a passionate home brewer for many years. He found his calling when sampling aged Belgian beers at his first Craft Brewer’s Conference (CBC). We opened our doors as Texas' only Belgian-style focused brewery making bomber bottles and kegs. In the last seven years, the craft beer market has changed a lot. Adelbert's has changed its line up to align with those changes. We introduced our first products in cans a little over two years ago. Over the past year, we've left our 100% Belgian-beer focus to introduce a broader line up of products, including a classic amber and rotating hop IPA. We also have several new projects in the works that we plan to release later this year and into 2019. Since its founding in 2011, Adelbert’s Brewery has grown to become an award-winning microbrewery in Austin, Texas. We believe excellent beer requires quality ingredients and hands-on brewing. We use non-GMO Bohemian floor-malted barley, Noble hops, and fresh yeast propagated at the brewery. While brewing, we utilize a multi-temperature decoction mash to extract a more complex flavor from our grains. Adelbert’s Brewery is a tribute to our founder Scott Hovey’s brother, George Adelbert “Del” Hovey. Del always took time to enjoy a beer with family and friends, recounting his travels from around the world. Our mainstay beers are named after stories Del loved to tell. We took his spirit of adventure and put it into each beer. With our vast array of beer styles, you’re sure to find a brew that suits you. A: We feature the GO TEXAN logo on our bottle and can packaging. A: It's important for people to know where their product is made; especially when it comes to craft beer. In todayâ&#x20AC;&#x2122;s climate, people are more focused on supporting local businesses, especially their local craft brewer. Some may not realize products are owned/ manufactured by big beer companies more focused on profits vs quality. Craft beer has grown a lot over the last few years. We went from maybe 1-2 breweries in each major city to over 20 breweries in each major metro area and more popping up in smaller markets across the state. With that growth, more consumers are shifting from mass produced mediocre beer to locally made, flavorful craft beer. The GO TEXAN mark is a way for us to highlight we're locally made. mark on all our retail bags. Q: Tell readers why being a GO TEXAN member and sourcing local is important? Mark Wall looks to carry on his Grandfather's legacy. Grandfather Wall, pictured. A: Being a GO TEXAN member provides us marketing support that we wouldn’t normally be able to afford. The reach GO TEXAN has is much better than we can sustain by ourselves. We receive emails and phone calls from member affiliates requesting our attendance at various state functions that ultimately give us greater exposure for our company and brand. It’s hard to do everything on a shoestring budget and limited resources, so we’re grateful for GO TEXAN support. Sauvignon Blanc has flavors of tart fresh citrus fruits like lime, green apple, and passionfruit with herbaceous aromas. The light, dry acidity of the wine is softened by the saltiness from the meat and cheeses. The sweetness of the fruits and jams will also be nicely complemented by the acidity in the wine. Sparkling Wine is a great pairing with the cheeses on this plate as the crisp citrus flavors and high acidity complement the creamy cheeses and the fruits and jams. This wine will also work to help cut some of the saltiness of the meats. The bubbles provide a great palate cleaning affect after every bite. The richness from the meat and grits call for a full body red wine to balance it out. Cabernet is complex and layered in its flavors of black cherry, blackberries and black pepper with tobacco and vanilla from the oak aging to finish it out. The higher tannins and acidity make it a savory wine that brings out the fruit flavors when drank with this rich plate. Zinfandel, sometimes synonymous with Primitivo, is a full body hearty red wine, with flavors of dark fruits like blackberries and currants and slight spice of pepper and cloves. The moderately high acidity and tannins in this wine make it a great pairing with the hearty richness of the whole plate. A lightly sweet Riesling with its citrus fruit flavors will help lighten and freshen up the churros while the sweetness will enhance the sweetness and spices in the dessert. Sparkling Moscato is a sweet wine with flavors of peaches and orange blossoms. With it’s highly aromatic citrus and a mild mineral scent similar to cinnamon, it provides a great match for the pumpkin churros. Add in the bubbles and you’re delighted with a nice zing to end the meal. A dry Riesling has fruit flavors of apricot, peach and lemon with aromas of honey, ginger and citrus blossoms. The dryness and high acidity make this wine a good balance to the creamy spice of the soup without adding any extra sweetness. Although an unlikely pairing, this semi sweet wine that boasts taste of citrus, honey, ginger, and cinnamon, that pair wonderfully with this silky and spice forward soup. While Tempranillo is a full-bodied wine that you wouldn’t normally think to pair with shrimp and chicken - the complexity of Paella helps magnify the flavors of this wine. Paella is an extremely flavorful dish full of spices which complement the cherry and plum flavors as well as the leathery spice and vanilla finish from the Tempranillo. Chardonnay’s fruit flavors of berries and citrus make for a rounded and silky texture that pairs extremely well with the crusty texture of the paella and is light enough to complement the shrimp, chicken and vegetables as well. Sherry is a fortified non-sweet wine characterized by tastes of preserved lemon, bitter orange, toasted nuts and burnt sugar, which makes a great complement to the burnt sugar on top of the Crema, as well as, creates a great contrast to the sweet creamy custard. Orange Muscat is a sweet dessert wine that tastes of bright orange zest, honey and lemon with fragrant bright aromas. The sweet acidity of this wine helps enrich and balance out the sweet and creaminess of the custard. DID YOU KNOW? H Texas is home to more than 400 wineries. H The wine industry contributes more than $1.3 billion to our stateâ&#x20AC;&#x2122;s economy. H Lone star wineries attract more than 1.7 million visitors each year. OCTOBER FUN FACT POSTER Collect them all! Click here to download. Nov. 12-13 The Texas Tribune is pleased to present a symposium on rural policy and affairs in Texas. Join us as we dive into the future of rural education, health care, natural resource preservation and infrastructure investment, and explore the current political climate in rural Texas and the stateâ&#x20AC;&#x2122;s economic future. This event is free and open to the public. PECAN HARVEST FESTIVAL OF RICHMOND [website] Richmond Pecan vendors needed! Other vendor spaces may also be available. Visit the website for more information. In a separate mixing bowl, whisk together the half and half, pumpkin purée, eggs, and vanilla. Add white sugar, brown sugar, salt, cinnamon, and pumpkin pie spice and whisk until combined. Pour the mixture over the bread pieces and fold until bread is coated. Keep in the refrigerator for at least an hour. Once ready to bake, preheat the oven to 350 F and grease an 8×8 inch square pan with Texas Olive Ranch Arbequina Olive Oil. Pour the bread mixture into the pan and bake uncovered for about 35 minutes. To make the sauce, melt the brown sugar with the Texas Olive Ranch Arbequina Olive Oil in a small saucepan over medium heat. Stir in the heavy cream until you have a smooth mixture is smooth. It should only take 2-3 minutes. This is my eigth year with the Texas Department of Agriculture. The thing I enjoy most about my position is seeing hard-working Texans grow their business and succeed and knowing GO TEXAN played a role in that success! I consider my region very special because of the diversity it encompasses; from Fort Worth to the smallest agricultural communities, from goat cheese to quality handmade boots and everything Texan in between! My region provides so many opportunities for weekend getaways or places to call home. Whether you are in Dublin, Nocona, Quanah, Fort Worth or a hundred other communities, you are going to have a great time and create lifetime memories! There is nothing else like Texas. If you took a different weekend adventure every week, you may not see everything to experience. However, when you travel, always check the GO TEXAN Event Calendar and search the GO TEXAN Directory for GO TEXAN members wherever you go! Known for the wines its grapes produce for wineries throughout Texas, Bingham Family Vineyards has now opened a tasting room in Fredericksburg, as part of the Yee Haw Ranch Outfitters new building on the south side of Highway 290 east of downtown.“We made the decision to open a tasting room in Fredericksburg because that is where so many people come to taste Texas wines,” co-owner and grower Cliff Bingham said. Read the Texas Wine Lover article to learn more. A new awards program from two enterprising Texans celebrates the state's love of all things, well, Texan. Texas Works Awards honors the best in locally crafted products, ranging from fashion to food to apothecary, and serves as an avenue to get consumers to support Texas-based artisans and business owners. GO TEXAN has happily partnered with this program. Grand prize winner will be announced November 26. Read the Dallas Culture Map article.